Promote YOU or Your brand, Not your podcast company’s brand! What would you rather have on YOUR website? Someone asked me to be a guest on their Blog Talk Radio show. They sent me a “Guest Intake Form” to fill out and part of the form is a $10 payment that YOU have to pay to be on their show. I didn’t fill it out. The way PowerPress works with the statistics redirect with a single show is that you sign into your blubrry.com account from the services and stats area of the powerpress settings (in advanced mode). This automatically puts the stats redirect in front of your media URL. 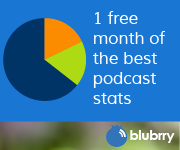 This only works this way if you only have 1 podcast coming from your wordpress site. 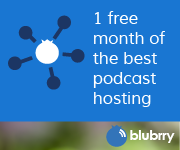 If you have more than one coming from your wordpress site using categories or channels, ALL podcasts from all categories or channels get the redirect from the show selected when you signed in to your blubrry.com account from PowerPress. If you don’t mind your stats all in one account, you can leave it like this. If you want them separate, you must do one of two things. Option 1. Create another listing for each show (category or channel) at blubrry.com and the main one will still catch all shows, but you manually put the redirect URL for the show you are posting in front of the media URL when posting. That way you will have 1 catch all that gets all the stats and another stats account for each of your shows that are separate. Option 2. Unlink your blubrry.com account from your wordpress blog. Then, put the redirect in manually each time you post. This option also requires that you come to blubrry.com to upload your file if you are using blubrry hosting. I got a Behringer UCA222 Soundcard to replace one of my Griffen iMics so i could tell them apart. On the Mac, the sound cards are named by the system and you can’t change them. So having 2 soundcards with the same name was screwing me up when I tried to do skype interviews using mix-minus (I will go over mix-minus again in a future episode). Problem mostly solved with the UCA222 and 1 iMic. now I have a very slight (you might hear it, you may not hear it) ground loop hum now. I just ordered a Boss B25N RCA to RCA Ground Loop Isolator for the setup, so that VERY slight hum will be gone by the next episode.